It has been a wild-weather ride this week, especially this past Tuesday when the wind howled through the trees and the lights flickered and the waves splashed into shore with a choppy fury. I felt it, this wild wind, in the early evening, the way it blew me sideways as I walked the short distance from house to Joy Center. And, as I approached the Joy Center’s driveway, I noticed the big pottery container standing on the stump by the road was empty. Darn it, I thought. Where was the tree? In December, I had stuffed a sweet pine into that pot and surrounded its trunk with snow, and, all winter, it had been the touchstone, beckoning people to turn off Southwood and into an event at Joy Center. The tree, that Cam and I were trying to secure by replacing the frozen snow with dirt, hadn’t just toppled over and fallen onto the ground. It had flown clear across the driveway and landed in a bed of pine needles. I picked it up, placed it back in the pot, and headed into the first of two yoga classes, knowing that, in any moment, it might sail off again. It’s like that for us too – we can be tossed around by the winds of change, thrown this way and that by outside circumstances. We can be pulled right out of our grounded center if we allow ourselves to care more about what other people think than about our own deep-rooted callings. And that is the difference between us and this sweet little tree that has trouble staying upright. We haven’t lost our roots. They are right here waiting for us in every moment to plug them into the ground, waiting for us to feel their strength. When we are unplugged, we feel like a live-wire, a loose cannon, a tree flying through the air. When we are unplugged, we easily become overwhelmed by a springtime howling wind. But when we press our feet into the ground, we feel it, the power that is ours to harness. The winds become our friends. The waves splashing the shore bring us alive. Our inner power does not flicker and die when we feel ourselves rooted; instead, it grows stronger as the springtime surges through us. Our sap rises and we feel our passion. New ideas spring up. New possibilities make their way into our consciousness. New energy is ours to play with. When we are plugged in, we say to the Universe, “Bring it on! All this life! All this passion! All this creative fire!” And when we are plugged in, the Universe indeed does bring it on, and the world becomes our joyous, sometimes raucous, playground. As the winds rattled Joy Center’s windows, we settled in for the first yoga class of the evening. That’s not quite true. We had some trouble settling in. Our minds were flying all over the place. One woman mentioned that it was as though the wind had scattered her in a million different directions. And I could relate. I felt scattered too. But there is nothing that settles me as quickly and easily as yoga does. Lying on our backs and feeling the ground beneath us and allowing the music to flow through us and allowing our breath to deepen – it wasn’t long before our minds made their way into the present moment, before we remembered that we could harness all this energy, that it indeed was ours to play with. By the time we were upright, bringing those spring winds through us in a series of sunbreaths, the same woman, the one who had felt tossed in a million directions, from a deep grounded radiant springtime place mentioned something about the Beatles. And as we continued to move from pose to pose, we all began to feel it, a rock and roll raucous windy energy, more Rolling Stones than Beatles, rushing through us. And it was fun! It was really fun, feeling alive from the inside out. Laughing in yoga. Laughing with the winds. I had a magical moment the other night! It was one of those flashes when a story, one that you’ve held dear for years, suddenly takes on new light and becomes even more precious. It started a few days earlier, last Friday, during the seven-hour car-ride south to Grand Rapids. Cam and I were going on a road trip, a weekend adventure to visit his mother in his downstate hometown. And, along with the snacks and the bottled water, we tossed in the book we’ve been reading for months, Born To Run, by Christopher McDougal. Our son, Peter, gave it to Cam last June for his birthday, and, once every week or two, we haul it out and read it at bedtime. It’s been slow-going, not because the book is boring – it’s not! – but because when I read, in what I think is my most-affected listener-worthy voice, Cam immediately falls asleep, and, when Cam reads, I last about three pages and then I begin to drift off, with the sea-rocking lull of his voice in the background. So, it took us over the Seney Stretch and along the northern shoreline of Lake Michigan to the Mackinaw Bridge before we caught up with what we had already read. And it’s a good story we’ve been reading! We’re only one-hundred pages into it, but now we’re captivated, and we’re clear about what’s been going on. Christopher McDougal is a journalist and an avid distance runner, a runner who finds himself injured on a regular basis. So, when he heard about this tribe of Indians who live hidden from the outside world in the caves and rocky floor of Mexico’s Copper Canyon and run with smiles on their faces for hundreds of miles at a time, without rest or injury, it became his personal quest to seek them out and discover their secrets. And, that’s what he does, and, along the way, he meets other characters as well, in a story that weaves together his journey into this grander-than-the-Grand Canyon-canyon in Mexico with stories of ultra-runners who are racing their way over the harshest mountain peaks of North America, pushing their bodies to the limit. As we headed south along I-75, I, the reader for the moment, was delighted to dip into a new chapter, with Cam, behind the wheel, alert and, not only paying attention to the straight stretch of highway, but also to the story that was unfolding like the spring leaves outside the car’s windows. And, as I read, we were discovering our own magical synchronicities within its pages. When McDougal is given a drink – Iskiate – by a local Indian to boost his energy as they climb up out of the canyon, I am thrilled to learn that it is made from chia seeds, the same kind of seeds that I brought back from my trip to Sedona this past November. And according to McDougal, these little seeds, the ones that I’ve been throwing in my smoothies all winter, the ones that swell up in water like tapioca or tiny fish eggs, are a nutritional super-powerhouse of omega-3, omega-6, of calcium and zinc and iron. “Wow!! !” Cam and I exclaimed, both vowing to step up our intake of Iskiate. There were other synchronicities as well. Many pages were devoted to a coach of a running team at a small college high up in the mountains of Colorado, the college where Peter has an interview in a week! But it was the Indians, the Tarahumara, who run with light sandals on their feet and smiles on their faces that brought smiles to our faces. Perhaps, if we felt the lightness in our bodies, perhaps if we touched our feet to the earth with the confidence of the Tarahumara, perhaps if we let go just a little of being so goal-oriented and found more joy in the running journey, we’d unleash it, too, this natural born runner within us. At any rate, we liked them, the Tarahumara, these mystical joyous mysterious-to-us people and we wondered where this running story, this story of freedom and ease and joy, was going to take us next. And it was Sunday in the early evening, after a Saturday filled with blossoming spring and sweet Mom time, that we found ourselves back up north in the Upper Peninsula, at the Co-op, scooping those tiny black seeds into a plastic bag. My friend, Brian, was working. “Brian,” I asked, “have you heard of chia seeds?” Not only had he heard of chia seeds but he had tips on how to use them, and, Born to Run, it was a favorite book. “It changed my life,” he said. And I wondered how it was going to change mine. Later, that evening, with our chia seeds soaking in water, and Cam fast asleep, I lay on the floor in the TV room, and my eyes, they just happened to wander over to the sill. And that’s when I had my magical moment. And something clicked inside of me. And the pottery vase that has always been special suddenly became even more special because it was made by Indians who are now our friends, who are teaching Cam and I to smile as we read and smile as we run and that our limits are not really limits, and that boundless joy can carry us far. I’m not sure why, but I’ve been thinking about India. Perhaps it is the sudden shift in weather, the way that spring has sprung in Michigan’s Upper Peninsula, not in its usual slow-melting gradual sort of way, but, instead, in one fell-swoop of brilliant color and sound and sensation. Two weeks ago, we were skate-skiing on a firmly-packed base of four feet of snow under the boughs of the blizzard-covered balsams, and, now, we’re in bikinis on the beach, and there is no snow in sight. Or perhaps I’ve been thinking about India because a friend of mine handed me a gift a few days ago, a book by Ram Dass, Be Love Now, a memoir in which he shares how he was transformed by his time in an Indian ashram. Or perhaps it is because I soaked in the passion that Kristen feels for the deeper aspects of yoga in her devotional class the other night at Joy Center, and then immediately went home and re-watched Eat, Pray, Love. At any rate, as the balmy breeze blows in through my open window on this, the second full day of spring, I have India on the mind. For a decade now, Cam and I have played the Mystery Trip Game, taking turns each year surprising the other with an adventure, usually in the spring for a week or two, and anywhere in the world. The only guidelines are that we can’t outright lie when we offer clues, and that we don’t lead our partner too far astray when we tell them what to pack. Three years ago, this April, we traveled to India. It was my turn to be “it” and I was following my gut. I knew that Cam had shaken his head many times in the past to the thought of an Indian vacation; “India is too much for me,” he’d say. “It’s your kind of thing,” he’d add. And frankly, India hadn’t been calling me either. I had been afraid that it might be too much for me, as well. But that particular winter, as the snow turned our northern world white, both Cam and I became captivated by a sweeping PBS series delving into India’s history and geography and people. It colored our winter world bright and expanded our vision, and, one day, I heard it as clearly as an ashram chant. “You need to go to India on your Mystery Trip,” the inner song sang. So quickly, before I changed my mind, I made the call to Delta and booked two tickets to Delhi. And in the ensuing months, I knew that I needed to focus, that this wasn’t a fly-by-the-seat-of-the-pants-type-of-trip like the one I had planned to Portugal some years earlier, where I had reserved the first night’s room and left the other thirteen days up to us and our momentary whims. I also knew that neither one of us would thrive for more than a few days in a huge sprawl of a city like Delhi, that we needed the wilds and the rivers and the mountains, that we needed a Himalayan trek. And, it was then, as I explored the Net for possibilities, that I found Ramesh Singh, or rather, I think he found me. 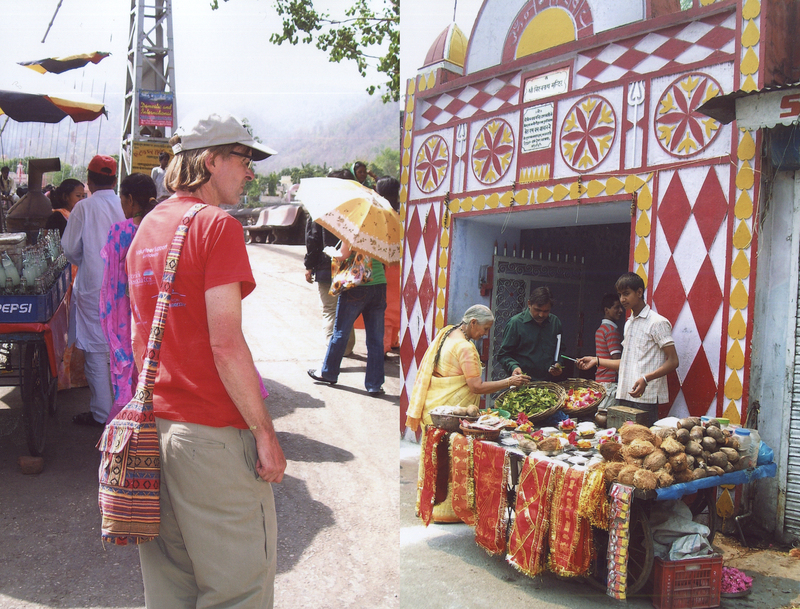 And Ramesh, from his home in northern India, helped me plan out the whole trip – to Delhi, and to the sacred river town of Rishikesh in the foothills of the mountains, and then up, up, up, twelve hours of driving up into the Himalayas. We planned for weeks at our computers, while Cam innocently went about his business without a clue of what he was heading into. And, later, in April and early May, Ramesh became our beloved guide and friend, providing assistance from the moment we stepped off the plane in Delhi, until we were dropped off at the airport seventeen days later. That makes the trip sound easy, that we had this inside help, that we never had to navigate a train, or drive a car, or figure out exactly where we were. But India isn’t like that; it’s not easy in the way that we know easy. India is thrumming, drumming, humming, racing, singing, dying, drenching life. India is an assault to your senses, an assault on your tidy life and clean feet. India picks you up and spins you around and sets you down again and you just don’t know what to make of it all. As Cam has said many times since returning from this adventure, “It was the best trip of my life and it was the worst trip of my life.” And the things that made it the worst trip of his life – the day of stomach sickness high up in the mountains and the bathroom adventures that followed, and the tiger that terrorized the donkey in the middle of the night and stole our cook’s backpack from under his sleeping head – these are the things that make the very best stories and are so fun to tell. And later, after arriving in Rishikesh, our other senses joined the Indian dance of stimulation. There was the distant sound of chanting music, and the bells, and the cars honking, and the smell of jasmine mingling with the smell of the bodies being burned in the sacred rituals on the banks of the Great Mother River, the Ganges. Yes, at first, it was too much, all these sights and sounds and smells. And then it was a game of taking in only what we could handle. But it really wasn’t very long into the adventure before something else happened, before something big and wonderful shifted for us. We, like the gracious people surrounding us and bumping into us and begging from us and singing with us and greeting us with a friendly Namaste, became more expansive. We surrendered to it all, this thriving thrumming hum of life; again and again and again, we surrendered. And when we glance back at the photos from this trip, we can see it, the blissed-out look in our eyes and we can remember how open our hearts felt. 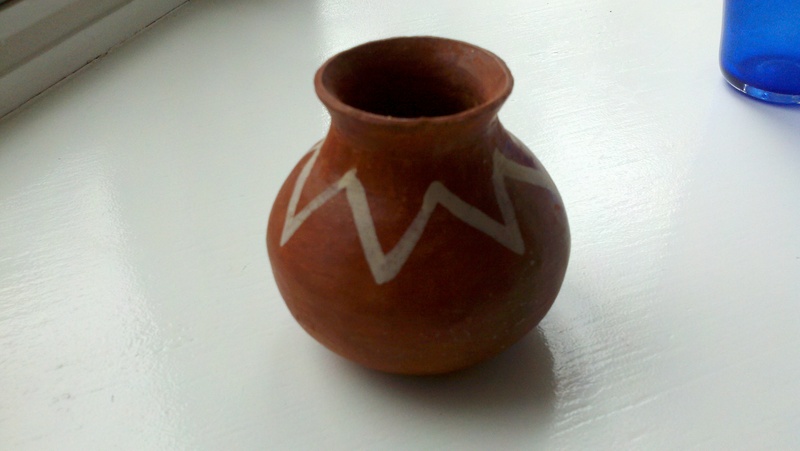 Indians seem to open their hearts to it all and I remember bringing this back home with me. And this winter, when my ninety-three year old mother’s body was cremated, I thought about the funeral fires that I had seen along the banks of the Ganges, and how this ritual was a part of everyday life, and this remembering brought me comfort as my mother’s body burned to a sand as fine as that on her coastal beach. And now, with this sudden thaw, with this wild rush of spring, I find myself thawing inside. I find myself surrendering to the bigness of an inner India. I loved the winter. I loved the frozen ground and the snow and the way I skated along on groomed trails day after day after day. I loved being present for my mother during her time of passing. And I loved winter’s holding pattern, the way it helped me to absorb it all, this new way of connecting with a mother no longer in her body. And I admit it; I wasn’t quite ready for this abrupt shift in the weather. I was looking forward to the more predictable gradual melting. And like I did that first night in India, I found myself in resistance, determined to hold on to that last patch of snow, that last bit of winter control. But I couldn’t hold on for long. It came. It rushed in with the force of the Ganges, this spring of bird-song and coyote-howling, of hopscotch and bike-riding, of sundresses and ice cream cones. It burst forth blossoming and fully-formed. So here I am, filled with the song of the Ganges, filled with the movie Eat Pray Love, filled with a softness in the air and an excitement in my heart. Can I really breathe it in, all this life, all this activity, all these new beginnings in this season of new beginnings? Can I admit that it feels good, to thaw inside and move forward at full springtime throttle? Last evening in the cool sweet twilight, we danced on the deck at Joy Center in Lucy La Faive’s Goddess Dance Party. The breeze was gentle and the peeper frogs sang to us and you could almost taste the freshness in the air as the last of the snow in the marsh was melting and I could sense my mother’s presence surrounding me, and it was pure pleasure, this evening in the land of new beginnings. “It is amazing how the Universe lines up with us, brings us what we are attracting in magnificent and unexpected ways.” That was the last line of a blog-post that I finished this morning. It was an essay I felt good about. I had worked on it for four hours. I had allowed the words and the story to flow. I had carefully proofed and crafted it into paragraph after paragraph that brought me delight. And then in one fell swoop, as if a magic trick got away from me, I made it disappear with my very own hands. All of a sudden, it was no longer standing there in front of me on the computer screen dressed in its fancy font. It was nowhere to be found. It was gone. And okay, I confess, I was hurrying near the end. I was determined to transfer this newly-birthed essay of mine from Word over to my blog-site, determined to push “post”, before rushing off to a jewelry–making workshop at Joy Center. And okay, I have another confession. There was more to it. Cam was bugging me. He was coping with the sudden dramatic shift in the weather by building a fender for his winter bike. And I know that this is a good thing, and I cheer him on as he, snow-lover like me, finds an innovative way to be happy in this sudden season of melting mud. But it was annoying to my sensitive trying-to-concentrate ears, the way he, in his frenzy, barged into the house and out to the garage, in and out, in and out, in and out. And when did that door turn squeaky? I wondered. So, okay, my mood wasn’t the highest of vibe when I pushed “Paste” when I meant to push “Copy.” And okay, maybe I shouldn’t have kept pushing things after that initial blunder, but I panicked. And my panic, it turned to despair, thirty minutes later, when my computer-savvy friend, on the other end of the phone, the one who I was pleading with, said that there was nothing, nothing at all, that she could do to find my missing high vibe essay. And I’m not exaggerating when I say that it was a high vibe essay. It really was. It was an essay about a high vibe weekend, last weekend, when Cam and I flew west to Salt Lake City on Friday for three days of play with our son, Chris, and his girlfriend, Diana. It was an essay about the magic that happens, the synchronicities we attract when we’re in this feeling-good high vibe place. And what snow-lover wouldn’t be in a feeling-good high vibe place while driving up into those Wasatch Mountains, into the clear high-altitude air and the blue blue sky and the crisp white snow? What snow-lover wouldn’t be bursting with it all, with all that heart-pumping playtime and all that whoosh of speed and all that mountain-top beauty and all that brilliant sun? Of course it was a high vibe essay. How could it not be when after the ski-time, there was the evening and the warmth of the valley and the heart of the city and the best, the very best Neapolitan wood-fired pizzas on this side of the Atlantic. Of course, I had stories to tell. Of course, the four of us attracted synchronicities. Of course a bagpiper showed up in the center of a town of Mormons just after we happened, just happened, to be speaking of our Scottish heritage. It’s like that when you’re in the flow. But what about when you are home again and spring has sprung a little too abruptly and your snowy playground is fast disappearing and skate-skiing is your favorite, your very favorite, sport? What about when your words, your carefully-crafted words, when they are disappearing, too? What about those unexpected surprises that don’t feel so high vibe, the ones that throw you for a loop, that toss you down into the muck? How do you find your way out of the muck and back up into that clear blue-sky vortex place where you are, once again, in alignment to receive those feel-good gifts? Cam built a fender today. And it lifted him right out of the muck and back onto his winter bike which he now can ride on those sloppy spring trails while staying vortex-clean and happy. And me. I drove to the highest ground I could find, to County Road 510, to the trail of slushy snow, and, wearing my sundress and leggings, I skied. I skied over the tracks of wolves, over twigs and pine cones and the poop of partridge; I skied my way up that emotional scale. And when the trail caved in and became a running stream, I stopped in my tracks, and I stood there facing the sun and the warm breeze, and I smelled the sweet fresh air and I listened to the sound of running water, and I felt my feet beneath me. I wasn’t melting away with the snow. I was solid and strong, and I was confident in this strength. I was back in alignment. And I knew that there would be something else fun after the snow disappeared, that I would attract it to me. I always do. And I knew that there would be other words that would come, other essays that I would create. And I knew that it is amazing how the Universe lines up for us, brings us what we are attracting in magnificent and unexpected ways. Sometimes our forward motion brings us back to our beginnings. It was while we walked on the beach at Popham Sate Park a month ago, my friend Muriel and I, that I felt the glimmerings of a new pull east. It was just a few days after my Mom’s passing and I was back in my birth-state tying up loose ends and visiting with friends and family. And on this surprisingly warm and breezy February morning, as Muriel and I breathed in the sun and the salt air, she spoke of her grandkids, how they all had loved their visits to “Grandma’s Summer Camp” in coastal Maine. She pointed to the river that flows into the Atlantic at Popham and described how much fun it was to float downstream with the kids when the tide was going out and how much fun it was to bodysurf into shore on the beach’s thrashing waves and how much fun it was to walk over to Spinney’s Restaurant after a day of beach-surfing and river-floating — grandma and grandkids — and dip into a double-dip of your favorite flavor of ice cream. And I welled up as I thought of my grandchild, the one who will be born in the beginning of the summer out in Boulder, Colorado. Who is going to bring this child the taste of the north Atlantic, if not me? 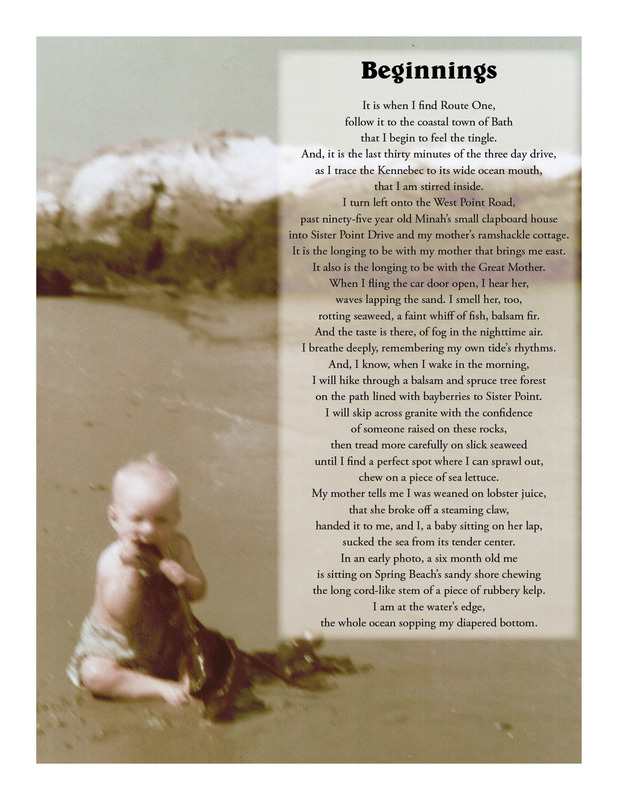 I know that this baby will feel connected to Michigan’s Upper Peninsula, the land that has been the adult home of my husband and I, the land where we became adults and grew our confidence and raised our boys, the land that we love as though we were natives, the land where the baby’s mother’s family are natives. Shelly’s parents, Grandpa and Grandma Ruspakka, live in the country by a lake on land that has been in the family for generations. They have a sawmill, an apple orchard, a tractor. They have friends and relatives who live nearby. And Cam and I know many of the trails of Marquette County and the coves and rocky shoreline of Superior by heart. And our kids, the parents of this grandchild, love the Yooper land and its people as much as we do. So, we have the Upper Peninsula covered. But what about Maine? Who is going to teach this child about the rhythm of the tides, about the sea and its shoreline, about the schools of mackerel fish, the flounder, the lobster who crawl on the ocean floor? Who is going to show this child that it is easy to find the baby crabs that live on the rocks at the water’s edge? Just lift up the seaweed and look in the cracks and crevices, and be careful; you have to pick them up in a special way! And watch out when you traipse across these rocks with your bare feet because the barnacles prickle and tickle and sometimes hurt, and they are living and breathing creatures and we don’t want to crush them. Who is going to tell this child these things?!? As I walked with Muriel on the beach that morning, on the sand and among the craggy coastal pines, I knew it was me, that I was going to be the one to share Maine with my grandchildren. And I knew that I didn’t need to figure out how it would happen, that the wanting it to happen was enough. And the next day, as I sat in the Old House that my cousins now own, the salt-bleached cedar-sided farmhouse that has been in our family for over a hundred years, my cousin Diana handed me a stack of photos, and among the photos was one that I remembered from my youth, one that I had written about some years ago in a poem. It is a photo of me as a baby, and now I send it out to my unborn grandchild, as an offering, a promise of things to come. I was planning to leap in one direction and then the storm blew in. By noon, on February 29th, the snow was blowing sideways and the streets were barely passable and it had become apparent that my “Leaping” performance scheduled at Joy Center for that evening was going to be a no-go. So, as the storm gained intensity and the day tipped into afternoon, there I was in my Ishpeming home, staring out at the howling white world and wondering where a gal was supposed to leap when her performance had just been cancelled and she was housebound and clueless as to what to do next. I looked around me and I saw a blizzard of projects: packages that needed to be mailed, thank-you notes that needed to be written, dishes that needed to be washed. Sure, I could keep myself busy. Sure, I could plow my way through the snowbanks of endless chores. There was enough inside-shoveling to keep me occupied for days. But it didn’t seem like fun. It seemed like work. And that’s when I thought of the quote I’d heard a few nights earlier while watching the Academy Awards. So, even though the spotlight might not have been beaming in my direction on Wednesday afternoon and the Upper Peninsula looks nothing like Hollywood during a Leap Day snowstorm and there was no performance in sight, I wondered whether I could conjure up some of that movie star glitz. After all, I say it all the time in yoga, that we are the stars of our own lives, living center stage in these movies we’re creating. And I want to create a feel-good movie. I want to have fun. I want to say it everyday, that sometimes life is wonderful, and this is one of those days. So, the first thing I did was light a candle. And then I shined the light inward. “What brings you alive right now, Helen?” I asked myself. “What seems like fun?” And all afternoon, as the wind shook the windows and the snow clung to the trees, I allowed full-out fun to be my beacon forward. I puttered in the kitchen. I snacked on foods that set my taste buds dancing. I journaled. I glued and pasted cards into a lovely handmade scrapbook. I answered the e-mails that have been sitting in my electronic mailbox for a week. I leaped from room to room, from task to task. It was a light-hearted dance, a springtime breeze of ease on this bonus day in February. I slipped on a summer-bright shirt over the winter smart-wool, pulled off the cold-weather beanie that has become my staple and donned the straw fedora that Abby, my cousin the milliner, made for me last summer. I felt cute. I felt happy. I felt like the star of my life. And it was somewhere in the midst of this stretched-out-wide afternoon of homebound happiness that I found the envelope of photos that my cousin, Diana, (Abby’s big sister) had given me. It had been sitting on the floor of my creativity room untouched since I returned from Maine two and a half weeks earlier. And now, in the spaciousness of a bonus day, I had the time to stop leaping and linger over this hodgepodge of old family snapshots. And later, during an evening when both Cam and I were home – because where else could we be?!? – we sprawled out on the couch, me facing one direction, Cam, the other, our legs entangled in the middle, and we examined these photos, soaked in the stories that they told. Many told of our movie star, in-the-spotlight moments: my parents beaming bright on the morning of their wedding; my sister, sitting at a table, wide-eyed and wearing a paper crown with the number five emblazoned across its center, candlelit cake in front of her; me and my three siblings plopped down on a wooden lobstertrap, posing for our Christmas picture. There was one photo, however, dated nineteen forty-three, that stuck out from the crowd. It was a picture of my twenty-two year old father, and it wasn’t an Academy Award-special-occasion-type-of-moment at all. It was an ordinary moment, an ordinary-extra-ordinary moment, not unlike the moment that Cam and I, and our cat, Fu Fu Princess, who had jumped up on the couch and joined us, were enjoying now. And it was delicious. 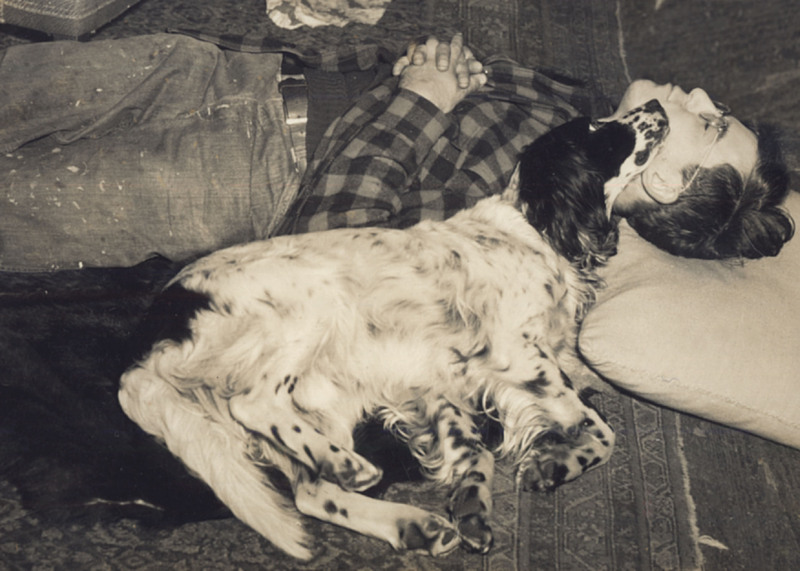 You could tell that it was delicious for my father, lounging on the floor, probably at the old farmhouse where Diana now lives and where she found the photo. And it was delicious for his dog, his English Setter, Tops, who was nuzzled up next to him. And it was delicious for Cam and I and our purring cat, sharing this moment of connection with my father and his beloved dog. So, there you have it; sometimes the camera focuses in on our movie star moments, and, sometimes, it is the quiet deep-breath of simply being that the flash of a bulb captures. On Wednesday, the spotlight didn’t shine bright over Joy Center way. And, I wasn’t glittering in my red carpet finery. And yet, it was an Academy Award Winner, this unexpected day of housebound leaping, this special deep-breath, no-performance, bonus day.